But Wallace-Wells is not a pessimist. Far from it! “We will, almost certainly, avoid eight degrees [Celsius] of warming” (p. 15). A mere four or five degrees is more likely. That’s just a bit less than the warming that preceded the Permian-Triassic extinction 252 million years ago, which knocked out almost all life on the planet and 95% of all species. Sea-level rise from melting ice caps is just “barely scratching the surface” of what is to come. Just heat death and heat waves will make parts of the earth uninhabitable. To that we can add the destruction of much of our agriculture (and spreading hunger), dying oceans, new plagues borne by ticks and mosquitoes, the draining away of freshwater supplies, economic collapse, and spreading conflicts as everyone scrambles for what’s left. Capitalism won’t save us, technology won’t save us, and politics won’t save us. Let’s remember that our President doesn’t even believe in climate change and is dismantling government research into the subject. But this is a non-partisan apocalypse; the neoliberal promotion of economic growth, endorsed by Democrats as well as Republicans, is what got us here. In a final despairing twist, he ends by questioning the whole agricultural revolution 10,000 years ago. We should never have developed agriculture in the first place! It might have been better, he suggests, to stay at the level of our primitive hunter-gatherer ancestors (p. 198). So, this book is many things. It is a telling, gripping, account of what will shortly unfold — or, in the case of many of the world’s poor, an account of things already here. But, in case it is not obvious, this book is NOT a call to action. As much as I admire this book and its excellent writing, I would urge the author to reconsider several aspects of his thesis. To begin with, we should firmly reject the idealization of our hunter-gatherer predecessors. At the point at which agriculture developed (10,000 years ago), these peaceful, innocent hunter-gatherers — with a population over 99.9% less than today’s — had hunted about 3/4 of the large animals in Australia, North America, and South America to extinction, and were constantly making deadly war with their fellow humans (far deadlier, per capita, than modern warfare). When we ran out of large animals to hunt, then and only then did we turn to agriculture. If our current system is really evil, the seeds were already present in prehistory, and we must confront them there. The one thing that I do not question is how serious our crisis is. The problem is not just worse than we think; it is even worse than the author thinks. He only considers one problem, climate change; he treats all other environmental issues only peripherally. Most critically, he largely ignores livestock agriculture. 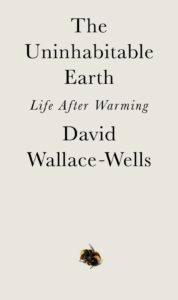 It may seem unfair to expect the author to consider other environmental issues in a book focused on climate change. But these other issues also affect climate change. Looking at peak oil, desertification, soil erosion, mass extinctions, and groundwater depletion initially seems to make climate change even more overwhelming than The Uninhabitable Earth presents it; but it also colors the problem in a very different way. It is not just our burning fossil fuels; it is our whole way of occupying the ecosystem. It will take some decades, perhaps until mid-century, before the worst economic effects of climate change start to kick in. But well before that happens, we will likely be faced with numerous other environmental and political crises. We may face an extinction crisis within the next decade, which will create its own cascade of consequences independent of climate change (though climate change makes them worse). Peak oil — which Wallace-Wells doesn’t discuss — seems to be the calamity most likely to trigger the near-term collapse of civilization. The economic effects of peak oil are already here, and we haven’t even reached the maximum peak of oil production yet! The end of cheap oil, about 2008, has created a moribund economy with endless public and private debt and a plethora of low-paying jobs. The political effects of peak oil — an understandably restless electorate and Donald Trump, to begin with — arrived shortly thereafter, with virtually zero awareness of the underlying environmental causes. Livestock agriculture plays a key role both in climate change and most of these other limits. The author refers to livestock agriculture peripherally, but appears unaware of its vast consequences. He is not a vegan, saying that he has no problem in drawing a boundary between humans and animals (p. 6). He briefly refers to “a meatless planet” (p. 169) and acknowledges that we should likely “shift away” from beef and dairy (p. 227), but without investigating the problem any further. I would urge him to investigate further. What have we missed? Greenhouse gas emissions due to livestock: perhaps they’re 18% of all human-caused emissions, as the FAO report Livestock’s Long Shadow puts it, or perhaps they’re closer to 51% (or more! ), as a WorldWatch article proposed, but there’s no doubt that it’s huge. Oceans deprived of oxygen (p. 94 ff. ): this is caused by industrial runoff, much or most of it from industrialized agriculture due to livestock. Groundwater depletion: most irrigation water is supporting livestock agriculture. Soil erosion is mostly a consequence of livestock agriculture — just because most agricultural land on the planet is grazing land for livestock. Wallace-Wells is clearly aware of soil erosion, because he quotes figures (p. 51) to the effect that soil is eroding 10 to 20 times faster than it is forming. Even without climate change, this is obviously not sustainable. Extinctions: these are caused by habitat destruction to make way for ourselves and our livestock. About 95% of the mammals on the planet, by biomass, are either humans or our livestock — a figure which Wallace-Wells himself cites (p. 154)! And about 2/3 of the biomass of those domesticated mammals is livestock, not us. The bloated presence of humans and livestock on the planet has crowded out everything else. Doesn’t this suggest some sort of pattern? Let’s look at possible approaches. The proposal most likely to take CO2 out of the atmosphere (as well as rapidly draw down methane), is a huge program of reforestation on former grazing lands. Wallace-Wells makes a brief reference to “bioenergy with carbon capture and storage.” But he quickly dismisses it as “magical thinking” (p. 45). When you track down his reference, though, it does not refer to reforestation of the vast quantities of land devoted to livestock agriculture (about 1/3 of the earth’s biologically productive land area!) — a proposal that he doesn’t even seem to be aware of — but to grinding up rocks and putting it on agricultural land (not sure where THAT idea came from). Getting rid of the livestock industry and letting forests take over grazing land doesn’t seem to have penetrated the brains of the world’s policy makers, who are instead bent on the very opposite: transforming forests into grazing land, as in Brazil. Reforestation is technically very easy and requires virtually no new technology or new infrastructure. All we have to do, is NOTHING: just stop breeding livestock like crazy. Doing this would eventually absorb most or all of the CO2 that humans have added to the atmosphere. Further, I would encourage Wallace-Wells to turn his attention to something more than an “ethics for the end of the world.” The situation is just beginning to get interesting, and you’re giving up? What his book really demonstrates, and very well, is that we’ve finally, finally reached the point where truly radical solutions have become plausible. Instead of being preoccupied with our coming doom, we should focus our tremendous creative energies on how to get ourselves out of this mess. We can start by getting rid of the livestock industry and stop making so many babies. Then we can begin thinking about the kind of world we can bring about that acknowledges human limits to growth. The earth is inhabitable, if we want it. Makes sense – as always. Good to see you back. I’m reading it too. I was struck by the author’s statement that he doesn’t understand why it is so hard to draw a moral distinction between a human and an animal! Well it’s because they are both animals! Beings with hearts, brains and nerves deserve moral consideration. If humans deserve moral consideration , it must be the same for nonhumans that are fundamentally the same. Ironically, it looks to me, our reluctance to replace petroleum means we are more likely to pull out all the stops later – when disaster looks inevitable- to fight climate change and the other problems you mentioned including dropping animal agriculture. The more we delay, the more likely it becomes that we abolish or nearly abolish animal ag, but will we have time left to save ourselves?